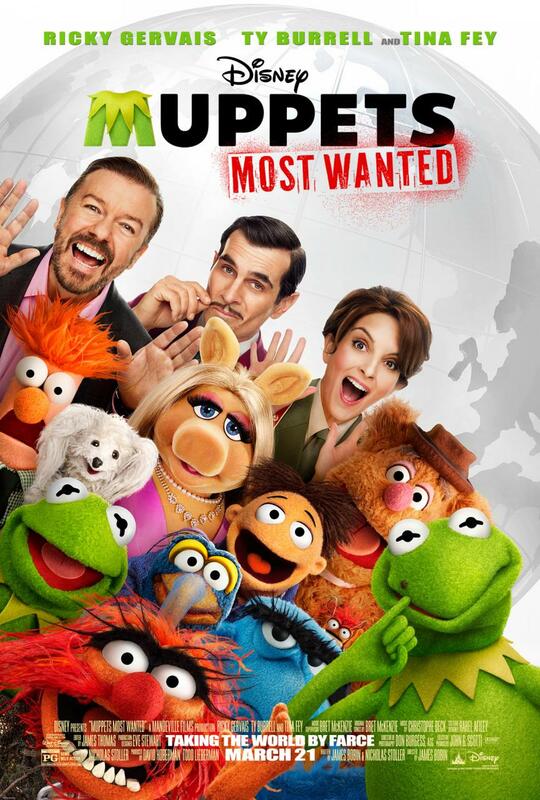 Meh-na-meh-na- Muppets Most Wanted? Unfortunately this time round, Muppets Missed Something. Before you ask, I am a big Muppet (We know that. Stop it. We’re better than that) fan. I’ve loved the TV series and the movie franchise. After the fantastic reboot, it was inevitable a sequel would be in motion. This is hilariously demonstrated in the film’s opening toe tapping musical number, “We’re Making a Sequel”. The list of unexpected cameos who pop their heads up in this film is ridiculous and unexpected, despite some being pointed out in the trailers to help flog the film. I won’t name them all because firstly it would be a long list and if not for the cameos, there wasn’t much to look forward to this time around. Don’t get me wrong, the Muppets are still funny and have their moments but the material seems to stretch on for too long and we’ve seen it done before a lot funnier before by the gang in their earlier efforts. A silly premise of Kermit being imprisoned and replaced by his criminal Russian doppelganger, the number one criminal in all the world, Constantine with a distinguishing feature makes for a funny gag that unfortunately drags on for too long. This cues a lazy excuse for a tour around the world with slapstick and shenanigans. It was great to bring Kermit back as the leading . . . frog after the last film was about Walter. Unfortunately, Walter doesn’t really appear or make an impression until the hour mark. However, when dealing with such an array of characters, it’s hard not to isolate certain characters. An unexpected inside joke pokes fun at this. It’s not all bad. Kermit’s incarceration in the gulag allowed for a funny prison musical number with Jermaine Clement (we’ve had one half of the Conchords, why not have the other? ), Ray Liotta (All my life I was always wanted to be in the Muppets. He doesn’t say that. But I wish he did), and Danny Trejo as . . . Danny Trejo. Tina Fey as the ice cold gulag warden brings the odd chuckle and her singing isn’t too bad, despite an exaggerated Russian accent. Now as you know a certain Mr Ricky Gervais (who has not stopped tweeting about this project) plays a pivotal role as the suspiciously notorious tour manager Dominic Badguy (Bad-guy? It’s French for nice man. Nothing? Well). Gervais’ comic delivery is surprisingly stale. Never was an actor. Let’s be honest. However, his expired ‘look to the camera’ face pulling spiel actually works and his song and dance number with Kermit was a surprise. He gives it a go and pokes fun at himself, inevitably Brenting it up. If you’re a fan of Gervais, then he’s does alright. Otherwise, his smarmy presence works for the role but just doesn’t quite click or come off as funny as you’d expect. This film seems to miss that energy and chemistry that Amy Adams and Jason Segel brought to the table. I mean even Chris Cooper rapped and still pulled off the evil role. The gags on the language barriers weren’t too bad, most notably in Berlin (Die Muppets? They hate us already). Fozzy Bear, Animal and Walter provide some of the more memorable moments. However, there’s one diva you can’t miss and that is Miss Piggy. It’s hard not for her to stand out (it’s like she’s real or something). A surprise duet with another “diva” made for a typical Muppet parody. The Muppets still bring the laughs but it seems that the human counterparts let this show down for me. I mean for the movie buffs, the Swedish Chef does a passing Ingmar Bergman reference. Straight over the little ‘uns heads but brilliantly done. The songs don’t seem to be as memorable as before, apart from the opener, they don’t stand out like the Oscar winning “Man or Muppet”. The cameos, despite being unexpected, are hardly fantastic or funny for that matter. Brings the odd smile but once you see them, they don’t do much else or stand out, bar Christophe Walz doing the Waltz. Worth it for the punditry alone. Ty Burrell (Mr Peabody and Sherman/Modern Family) is a notable exception. His Clousseau-esque detective is not bad and his rivalry with the Eagle makes for a cheeky poke at US/French relations with a compensating big badge off. A guilty gag that gets a giggle. It has enough for the little kids but for the bigger ones, to quote the opening song, “The sequel is just not as good”. Currently ranks #101 out of 156! *Please note before the film there is a good little Monsters University short called Party Central. Nice review. Think I liked this one a bit more than you did. The songs aren’t quite up there with the reboot and the plot is weaker but the self-deprecating comedy won me over in the end.